Perhaps the most common symbol of the Cold war, The Berlin Wall divided the city of Berlin from 1961 until 1989 separating families and loved ones. After re-unification, the wall was dismantled and removed except for a few remaining pieces. 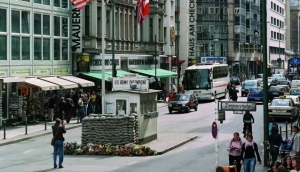 My Destination Berlin lists all the places in Berlin to see, and experience the Berlin Wall, including the East Side Gallery, the Berlin Wall Memorial, Checkpoint Charlie, former border crossings and other locations around Berlin. Take a bike tour along the route of the Berlin Wall for an interesting thing to do during your stay.